We have to admit, most of the time we travel budget. And by budget, we kind of mean the cheapest room in the cheapest hostel or apartment. But concertinaing yourself into a cramped bunk bed with a snoring roommate, or enduring apartments so cramped you can practically touch all 4 walls in bed, each so thin you can practically hear your neighbours chewing their breakfast each morning (yep, happened to us!) is no way to begin a dream Parisian holiday! A place like the Hoxton Paris. Staying here for 2 nights was definitely a splurge from our regular travels, and yet, the minute we walked into the stylish atrium-style entrance, we knew accommodation had been ruined for us forever. Set in a historic 18th century mansion once owned by Etienne Rivie, advisor to Louis XV, and now classified as a monument historique, the Hoxton Paris is undoubtedly the most beautiful place we’ve ever called home for a few nights. It's stylish beyond belief, absolutely beautiful, and the beds... oh my gosh, the beds. Here's a review of our experiences there! If you’ve visited London lately, you’re probably already familiar with the cooler-than-cool Hoxton brand. Born from the desire to create a hotel space where guests could hang out in trendy neighbourhoods, in style - but without the towering designer price tag you might expect - this small chain of boutique hotels was born in the hipster streets of Shoreditch in 2007. In 2014 there was Holborn, London. then Further locations opened in Holborn, London (2014), then Amsterdam (2015), and then, late last year, the doors finally opened to this grand Paris location, the largest of the Hoxton offerings. Unlike most Brits abroad, the brand travels across the channel exceptionally well. Leaving behind the exposed brick and graffiti-lined streets of the Hoxton’s original home, this new sleek glass-and-plush offering perfectly melds the unique style and ‘cool’ of the Hoxton with the ‘ooh la la’ glam of the City of Lights. Judging by the number of cool Frenchies we spotted hanging out around the foyer, the Hoxton Paris has been welcomed with arms open by the locals too! 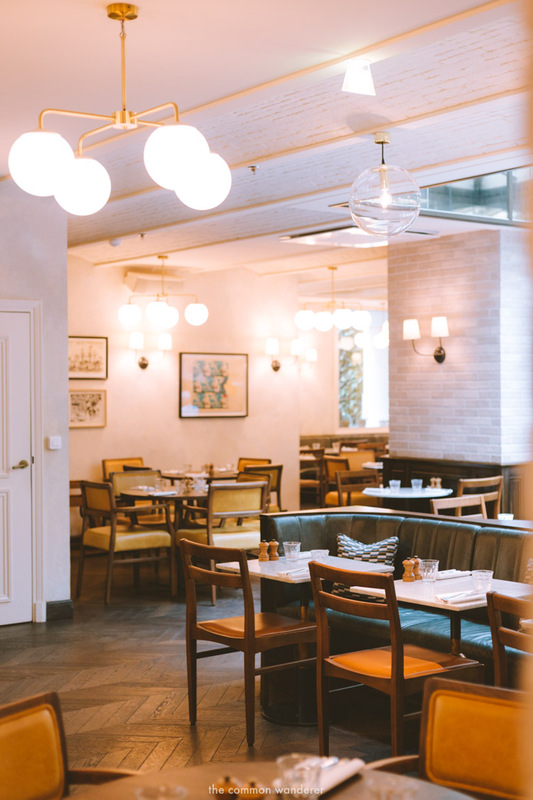 The Hoxton Paris just oozes style, and a comforting, homely vibe - moreso than any other hotel we've stayed in before. During the day, like other Hoxton offerings, the courtyard and cafe areas are full of the same kind of creative-looking types that we hope (read: wish) we look like when we're cafe-officeing. 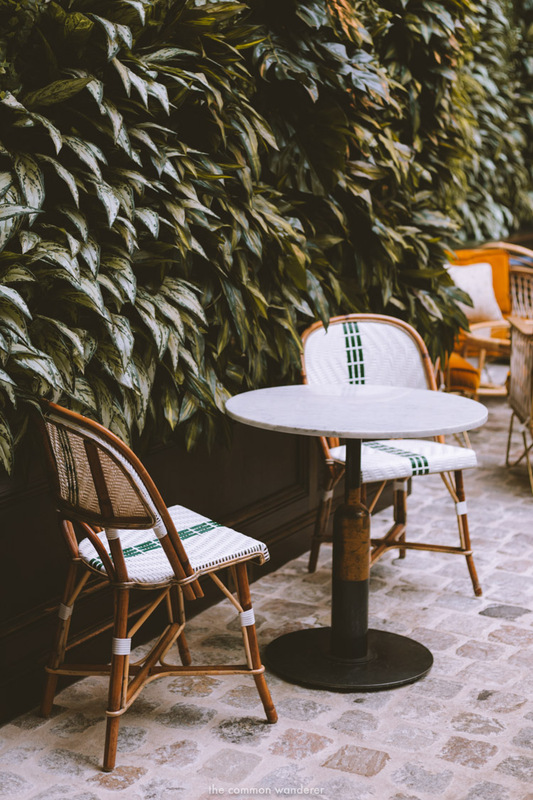 Business meetings are held, freelancers tap away at their laptops with a (bloody good) coffee always within reach, and stylish holidaymakers enjoy lazy late brunches with friends in the courtyard. We could have stayed there for hours, it’s such a bright, friendly, and super inviting space to be in! As dark rolls around, the hotel dims the lights actually began to remind us of an old library; all cosy dark corners, wooden finishes and plush, comfy furniture. There are a couple of bars to wile away the later hours at, and we can’t think of a better spot to enjoy a nightcap before retiring to your chamber for the evening. We also need to take a moment here to recognise how brilliant the Hoxton staff are; super friendly and helpful without being stuffy or feeling like they’re always hovering nearby. It also says a lot when the same staff member who walked you to your room the day before greets you by name and asks after your day when you bump into him on the street outside the hotel the following day! 5 points to Hoxton Paris for that one. Despite its size - this is by far the largest of the Hoxton’s offerings - we actually walked past the Hoxton when we first arrived, so unassumingly does it blend into the classically beautiful stone buildings that it shares the street with. But just beyond the giant glass front door lies a totally different world. From the cobblestone and glass entrance way to the plush statement furniture and wooden chevron-patterned floors throughout; it’s contemporary but quaintly charming, nostalgic but uber trendy, and basically, every interior design goal we have for our future home. There’s the Rivié restaurant with a large dining room with copper accents, and the instagram-worthy lounge area with a ‘living wall’ full of plants. A charming old-world staircase and cosy cocktail bars to wile away the evening hours in. So much thought has gone into detail and comfort here that we often commented to each other than we felt like we'd been invited into the beautiful home of a local friend - one with oodles of interior design talent! Rooms at the Hoxton Paris are a New York loft-style meets 50s retro glam and industrial hip kind of cool. In fact, think of the best interior design Pinterest board you’ve ever seen, and you’ve basically just found the Hoxton’s living quarters. All of the 172 rooms here follow the Hoxton’s traditional sizing conventions: Shoebox, Cosy, Roomy, and Biggy. Our room was a ‘Cosy’ (check prices and availability here), and actually felt pretty roomy despite actually being quite compact in size. 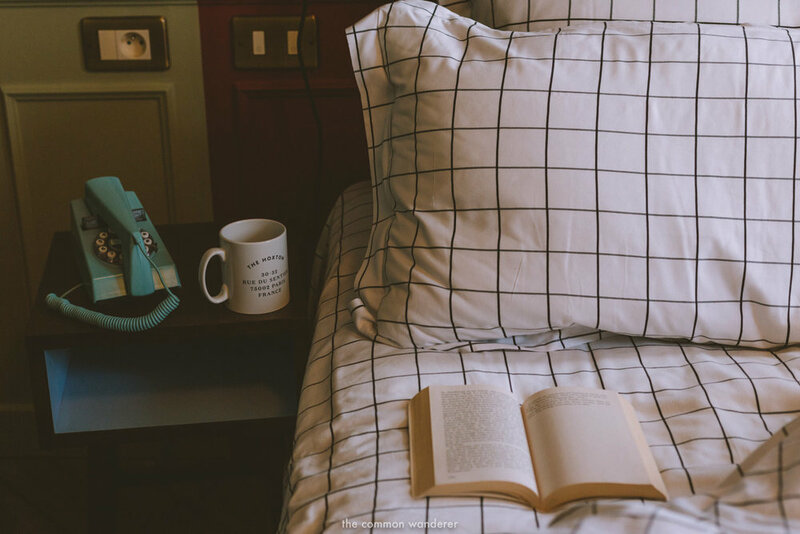 With the retro leather-bound Roberts radio playing music, a welcome treat on the bed, and that luxurious bed (with those grid-checked sheets that are just made for the ‘gram), we felt at home from the minute we walked in. One of the touches we loved most was that 172 local Parisians were asked to contribute to the Hoxton’s in-room library collections, which makes every single room’s collection entirely unique. Such a lovely way of making you feel at home in a foreign country! The bathroom, enclosed inside a metal and smoked glass structure, takes up a pretty big portion of the room but for good reason. 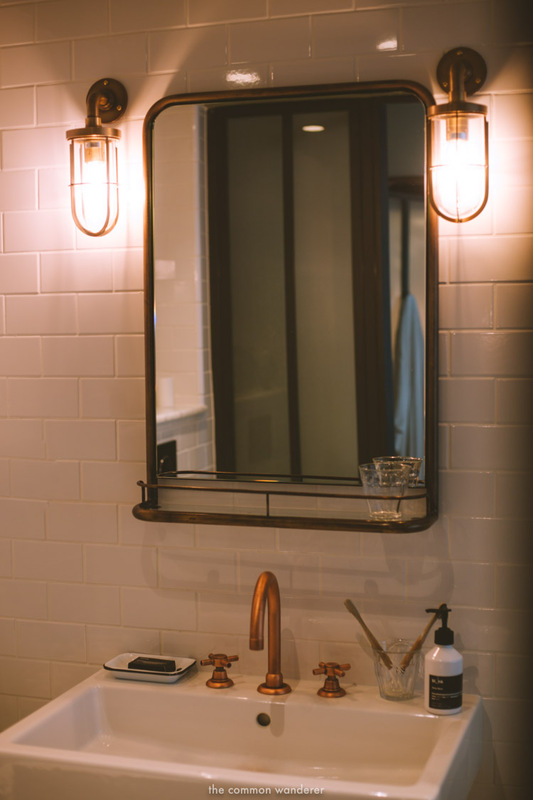 With white subway tiles, copper fittings, vintage lamps, and the walk-in rain shower to end all showers (with insanely good pressure too! ), this bathroom deserves all the space it gets! There’s also a metal cupboard hanging space that also has all the essentials: tea, coffee and complimentary milk and water. The hotel also offers free wi-fi and international calls (1 hour). Unfortunately, due to a super tight filming schedule during our time in Paris, we didn't actually get to enjoy the delights of the in-house restaurants - although from what we saw gliding past us as we walked through the hotel, we were definitely missing out! For those who have more time to spare than we did, there's the beautiful main Brasserie-style Rivié restaurant (check out the photos below! ), and the harder-to-find Jacques Bar, an intimate Moroccan-inspired bar with some of the most divine wallpaper you'll ever see in your life. One thing we did get to take advantage of however, was a humble Hoxton classic that has travelled across the seas too: the Breakfast Bag. In each room, a paper bag awaits you every day, and all you need to do is fill in what time, and how many breakfasts you'd like. Hang the bag on the door outside your room, and voila - a fresh yoghurt with muesli, orange juice, and banana magically appears for you at the set time the next day! It's a great idea, particularly if you're itching to get out the front door and start exploring without having to wait for a heavy breakfast to appear. The only downside was that this option is super high on one-time use plastic which, if you've read our blog for a while, is a major concern for us and something we're trying to eliminate from our lives. It was a little disappointing to see, and probably the only real negative we encountered - but we hope that these things will change in time! When it comes to location, the Hoxton Paris can’t really be beaten. 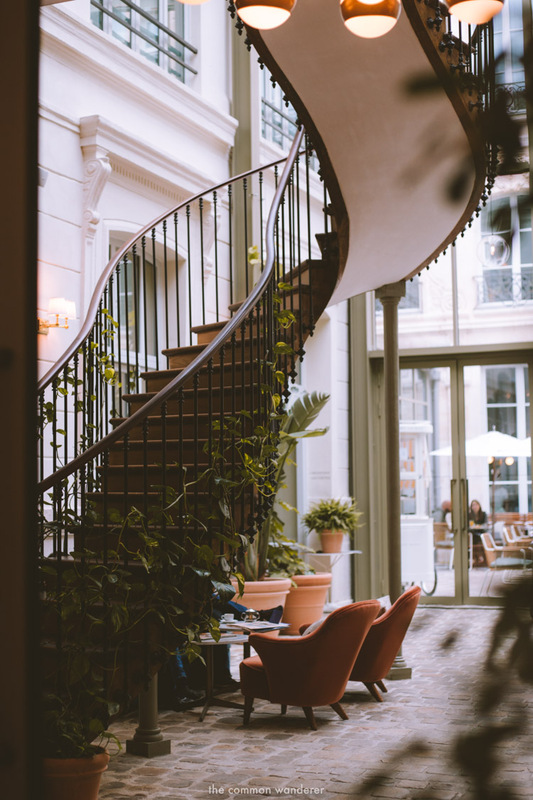 Located on the Rue Sentier, a surprisingly quiet main street in the second arrondissement, it’s walking distance to the eclectic and trendy le Marais district (our fave part of Paris! ), the Louvre and all the magic that part of old Paris holds, dozens of brilliant eateries, and basically everything good about Paris. There are stacks of transport links nearby, with Gare du Nord and Gare de L’Est both just a 20min walk away, while the Bonne Nouvelle metro station is literally at the end of the street. Have you stayed at one of the Hoxtons around the world? Drooling over those insta-worthy interiors? Share your experiences with us in the comments below! 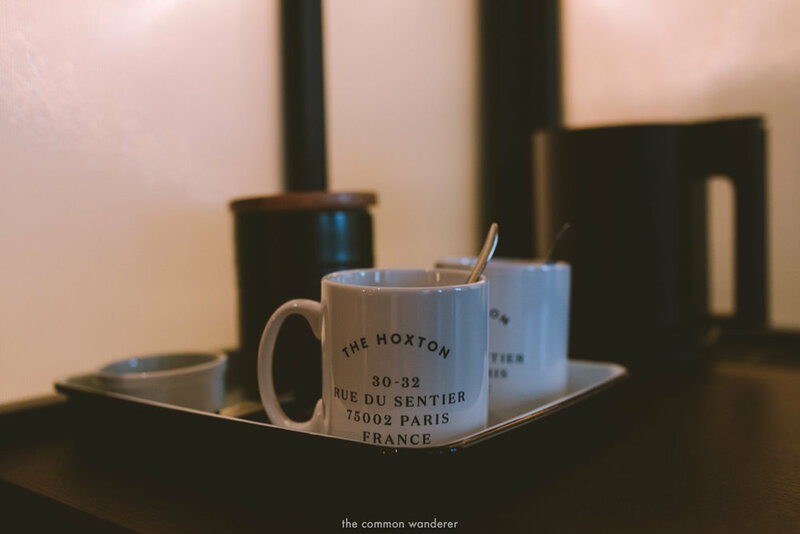 Our stay at the Hoxton Paris was sponsored by the Hoxton and Atout France - but as always, all opinions, thoughts, and typos are very much our own!